Jessica was looking for a fly fishing guide for Miami. They were coming to Miami for a quick weekend fishing charter from Colorado. She booked a 3/4 day charter with me on Sunday. We headed out in search of some tarpon fishing on the inshore water of Miami. We found a nice group of rolling tarpon in a quiet part of Miami within ten minutes of getting there, Jessica hooked up a 100 pound tarpon. It instantly started jumping all over the place; with one of it’s jumps going 6 feet in the air. After around 5 or 6 jumps the hook pulled out and the tarpon got away. We did not hook the tarpon on the fly though, instead we got it while fishing a bait rod. So we got back to fishing again and for whatever reason some people decided that they wanted to water ski right on top of all the tarpon. We stayed and tried to fish but it just was not going to work after all of that. 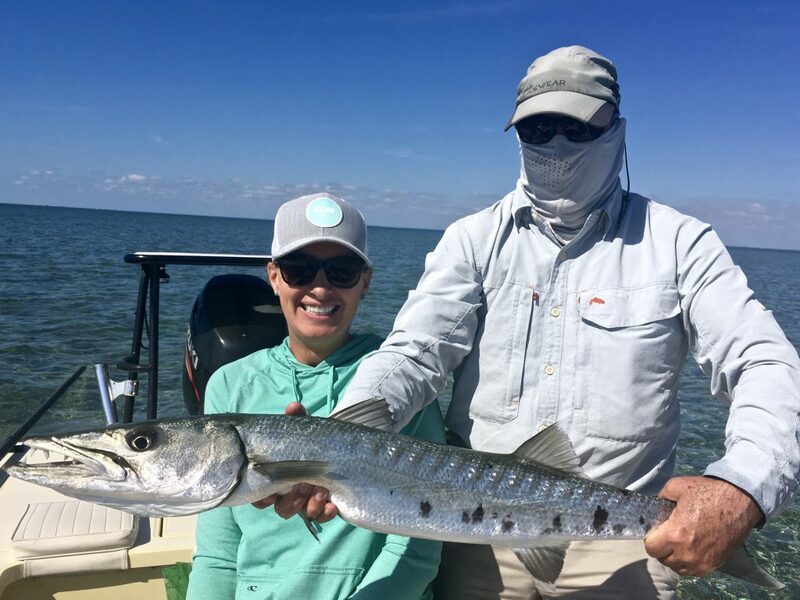 So we tried a couple other inshore spots, but the tarpon fishing was not happening there that day. So we headed off the the flats of Biscayne bay. We tried a couple of spots for some fun fishing that usually works well for people that want to fly fish. It was dead calm and glassed off and that makes all fish extra spooky and difficult to get close enough to get a fly cast to the fish. We went to a spot that has been holding some barracudas. First, Jessica hooks one and we land it. We were able to take a few photos before the release. Then after a little while get another barracuda on, Darryl was able to land that one also. 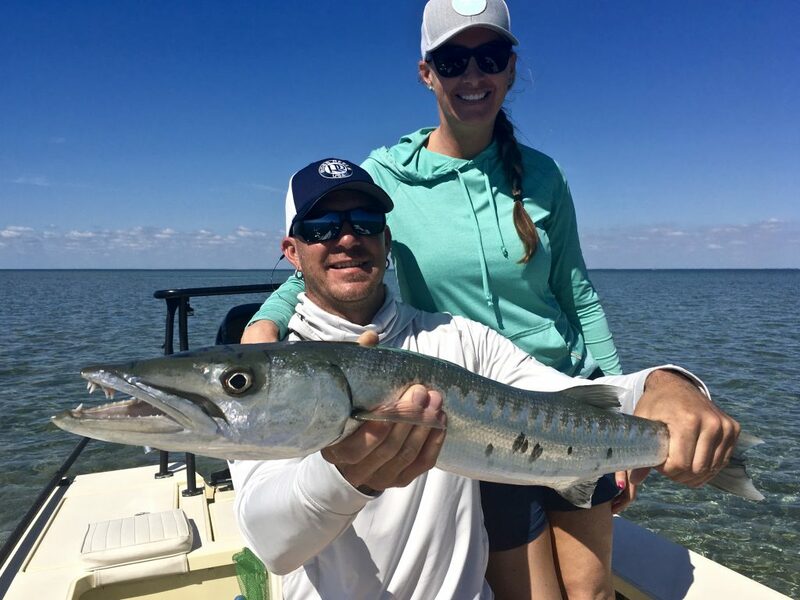 Both put up some great fights, jumping several times and taking some long runs through the shallow water of Biscayne bay. Darryl wanted to try to get a bone fish while fly fishing. The tide was just getting right for that and we set off we found a few mudding bone fish. A mudding bone fish is when the bone fish is feeding on the bottom, digs into the bottom; getting shrimp and crabs that the bone fish smells and blows the mud and sand out of it’s gills . This makes them easier to see and catch. We got a few fly casts off but just did not get one hooked up before we had to head in.